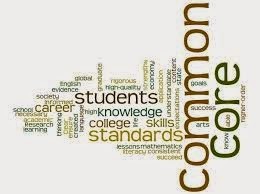 Okay, outta the way with my accusatory statements about Common Core and then we can get on to other topics in another blog post. I could actually argue FOR or AGAINST the CC, with my ammunition of evidence and citations, to use a little lingo from the well-known source itself. a) I spend a lot of time translating and navigating convoluted assignments given to my students in approx. 4th - 10th grade. Which are based on the Common Core. While I can beat the drum of critical thinking just as much as the average administrator, I also know that developmentally the writing brains of 11 year-olds are not ready for this level of argument. Talk about turning a kid OFF to writing! and analyze the two main character's motives in one paragraph, using textual evidence." b) I like to find out what is on the minds of the majority of stressed-out teachers in the U.S., given that they are the unsung heroes and they don't really get their own form of Veteran's Day to honor their sacrifice. c) I used to teach in a school where we had to turn in precise lesson plans to our principal, with the numerical listing of the Illinois State Standard right alongside them. It didn't make me a better teacher, but I learned to write tiny, and could spout some lingo in the standards to said principal. d) I was initially excited years ago about the concept of standards being aligned between states. "Clear goals and confident, well-prepared students." It sounded so hopeful! Just like in this video! e) Since some families move a lot, and teachers do too, it sounded promising. Plus, when I traveled and presented staff development I had to re-learn some particular differences between states. Confusing. Finally we could have the same oral reading fluency benchmarks, fractions taught in a hands-on way at about the same point in 4th grade, and history key points would not be sanitized of the Native American's impact on our country. f) I am assisting two homeschooling families in teaching using CC starting next year. We don't have a principal observing our lessons, but we have to turn in monthly reports proving we did academically worthy, Common Core stamped of approval-ness instruction. I am happy to find sources like this to pick and choose from. Phew. Lessons and example writings from actual kids, and a fairly easy-to-use website. And then there are those techie people who save the day with websites like this one, where we have a fashion runway of apps and software to make teaching life easier or more complicated, depending on how organized or techie the reader of the website is! I am going to rebelliously NOT wrap this up with a neat little conclusion, because this was not a "5-paragraph essay" and it is midnight.